I've been doing Manga Mondays every week since I started my blog 18 months ago. It's always been a personal feature, but now I'm going to try turning it into a meme. There are quite a few people who do Manga Mondays. I don't claim by any means that I owned or created the idea of Manga Mondays - it's an obvious choice given the alliteration. I think a meme would be a good way for everyone to publicize their own Manga Mondays and get a little more publicity. 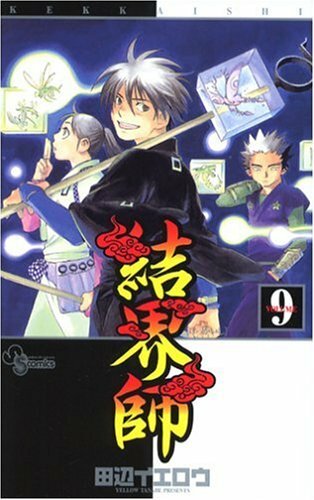 Volume 9 of Kekkaishi is somewhat of a placeholder volume. A lot of different things happen that provide background for the ayakashi and although things that lead into future plot points. I have mixed feelings about this volume. On the positive side, I loved the story line that forced Tokine, Yoshimori, and Gen to work together. Their natural inclinations are to be three lone gunmen who happen to be in the same battlefield. Gen's "monster tamer," otherwise known as teacher/mentor/babysitter arrives to change things for the trio. Like most of the adults in this series, she's a bit twisted. You don't know whether are to help or harm the group. But it makes for an interesting battle as the trio are forced to work as a team to defeat her challenge. On the unsure side is the story line about the ayakashi. We are introduced to Princess Kokuboro. Apparently her powers are weakening and she needs to harness the power of the site that the trio defends in order to survive. I'm a little confused on exactly who she is or why the fighting ayakashi seem to be holding her prisoner. Or are they protecting her? I don't know. It adds another layer of complexity to the ayakashi. They have someone in their society they consider a princess. It shows they're not flatly evil nor are they without intelligence or human-like traditions. I don't know what direction the plot will go with this, but it's interesting. For the moment though, I'm quite confused. There's a third story arc involving Matsuda, a friend of Yoshimori's grandfather. He's the old professor type. Very eccentric. The ayakashi try to take him over and fake his suicide. But he doesn't actually get taken over. He just lets the ayakashi think they've taken him over and then he actually does commit suicide. It's very confusing and I don't yet see the point. But I'm sure there is one. Overall, this volume is interesting, but it leaves so many questions unanswered that it's one of the more frustrating volumes. I can definitely see how this volume would be a bit frustrating, I like some unanswered questions - it just makes sense to have some in an ongoing series- but too many usually makes me wonder if I even want to continue for fear I'll only get more in the next book. Probably not as much the case with manga since they're shorter/quicker reads, but I'll be interested to see if you get some answers in the next volume! Love that you turned it into a meme! This is one of my favorite features on your blog because it's so unique.